Come enjoy the Beauty of Carthage as you journey down the Maple lined streets. Experiencing the Fall colors as the sun begins to set. The Race starts at 6 p.m. 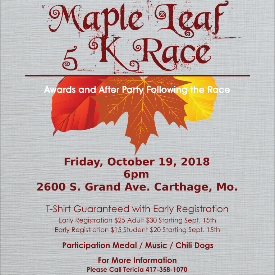 Early Registrations (before Sept. 15th) include a Participation Medal, T-shirt, Race Day Swag and Express Check In. Twilight is a magical time with music & food adding to the evenings festivites. Racers enjoy a free meal with family fun located close by at the Annual Maple Leaf Carnival. Dead-line for Guaranteed Race Day T-shirt with Registration is Sept. 14th. Supplies are limited after Sept. 14th, T-shirts will be reserved on a first come first serve basis according to registration date. Awards ,food & entertainment begin following the Race . This is a chip timed event with race times available as racers cross the finish line. Additional Parking is located behind the Y at the water tower.